Capture and relive your memories in Full HD quality with SanDisk's Class 10-rated memory card – designed to keep your data safe in all circumstances. This microSD memory card can store up to 128GB of videos and photos so you won't have to worry about what to keep or delete. Capture, carry and share exciting moments from your life in the palm of your hand. Take video recording to the next level with SanDisk's Class 10 recording capability. With this high-quality memory card in your device, your Full HD videos will never break up or suffer drop-outs. 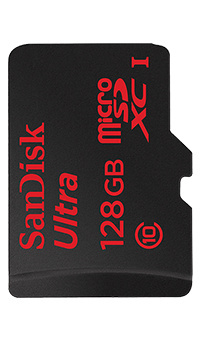 This memory card can join your adventures in the snow, the pool or even the desert. Its durable material protects against water, X-rays, temperature and shock, so you'll never have to choose between living through an experience or capturing it. The included SD adapter is compatible with digital cameras, and it lets you copy and store your photos and videos on all of your devices. And with a transfer speed of up to 80MB/second, you'll be able to spend more time watching your videos.